Whew, what a day to try and create a card about snow! A good portion of Alaska has been hit with a big storm coming in from the Gulf of Alaska and for my area that meant hurricane force winds that brought in warmer temps, so no snow, only rain. However the low will be sweeping through in a few hours and they are saying we'll be seeing snow overnight. With the wind blowing like mad I sat down this morning to make my Jingle Belles card and wouldnt you know it...the power went out! We just got it back on and let me tell you, it was interesting trying to create in the dark. Even though I have a big window in my bedroom the way my craft area sits I dont get much natural light at my desk, plus it was cloudy out so what light was streaming in wasnt very bright. Lots of snow falling there! Anyway, the challenge issued at Jingle Belles was to create a card with soft elements...."batting, velvet, fibers, denim, thick layers of embossing powder, soft silk flowers and snowflakes, pillow stickers & upholstered brads! Really, anything your brain can come up with that is SOFT, it doesn’t have to be only papercrafting products that you use, either! I encourage you to pull out those quilting, knitting, sewing, & flocking skills! I ended up adding Fun Flock to my house for snow as my soft element, and maybe the quilted ribbon could be considered soft? I also added some Dazzling Diamonds for a sparkly snow-on-the-ground look. I used last weeks sketch from Splitcoast also(I think it was last weeks). Love the texture of that pretty ribbon ... and of course that *soft* flocked snow ... so glad you joined us at jingle belles. how did I miss this last week? 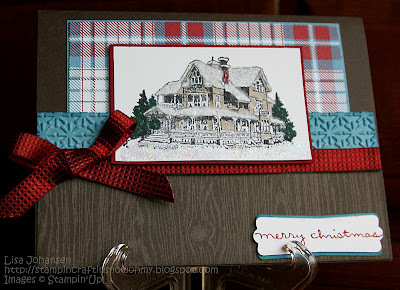 Such a gorgeous card and the colours are lovely, I love what you did with the flocking and the house stamp is so gorgeous. But I especially love that you backed it all with woodgrain - got a thing for woodgrain at the moment! love it!